Equipment measures water levels in wells and drainage systems. Professional appliance used by police for detecting explosive substances. 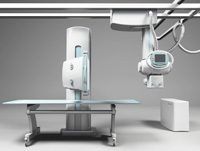 Medical equipment used by physicians for projecting X-rays.